Opel isn’t being coy about the upcoming 2016 Astra, that’s a given. In fact, Opel has touted the 2016 Astra to be a true world-beating compact car, with intelligent engineering at every corner. Opel has detailed how the latest Astra was able to shed a whopping 441 pounds from its curb weight without sacrificing safety, performance or spaciousness. 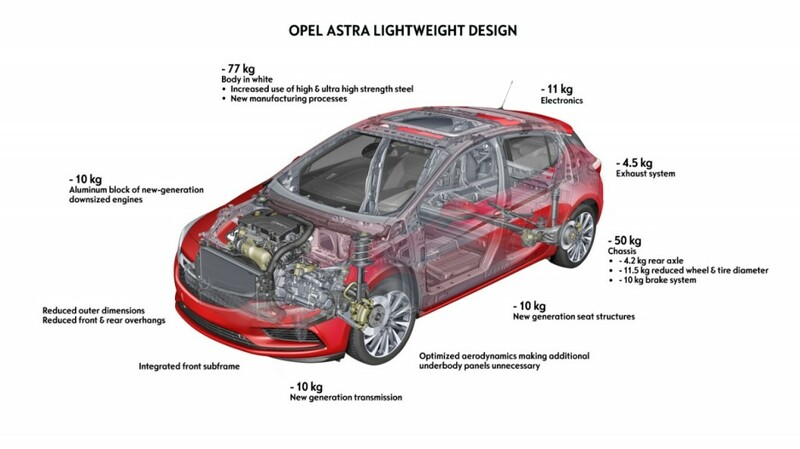 Foremost, the overall body shell and structure of the 2016 Opel Astra are a major factor in slimming the car down, but ultra-high-strength lightweight steel in chassis components also save 110 pounds alone. In addition, engineers decided against full underbody paneling. Not only does this save weight, but it also helps the 2016 Astra achieve a drag coefficient of 0.285. To put that into perspective, the 2016 Astra is even more streamlined than the 1984 Opel Kadett, which achieved a drag coefficient of 0.30, a major achievement during its time. The 2016 Astra is almost two inches shorter than the outgoing Astra, and sits 0.2 inches slimmer, but engineers didn’t create a smaller packaged interior. Specifically, the Astra’s new seats provide added legroom in the rear, and added distance between the first and second rows allows for an even greater sense of space inside. Finally, the 2016 Opel Astra’s new 1.4-liter Ecotec turbocharged four-cylinder was developed with performance, and weight savings in mind. The aluminum block alone is 22 pounds lighter than the old car’s cast iron unit. Opel will continue to dish out more details on the 2016 Astra as we approach the car’s official debut at the 2015 Frankfurt Motor Show. But, there’s not wonder Opel is this flamboyant about the car. The 2016 Astra is poised to be a big deal for the brand. 441 lbs!!! That is truly an incredible achievement! Too bad we don’t get a version of this car. By comparison, the new Cruze is saving, I think, 220 lbs, and that number is for just one configuration? Hmm, that would be nice, but outdone by the Astra by a long shot. Granted, the Astra shrunk a bit, while the Cruze had to grow a couple of inches. That accounts for some of the difference.